A 35 y.o. male was operated in our facility 1.5 years ago. Walked with cane about 8 months, then with full weight-bearing. Hardware failure was revealed this January. The current situation is presented at the attached image. The head looks not deformed and hip ROM is good. Which way should be preferred? What would be optimal for the case? Osteotomy - McMurray or valgus? Osteosynthesis with core decompression? THR? Something else?. 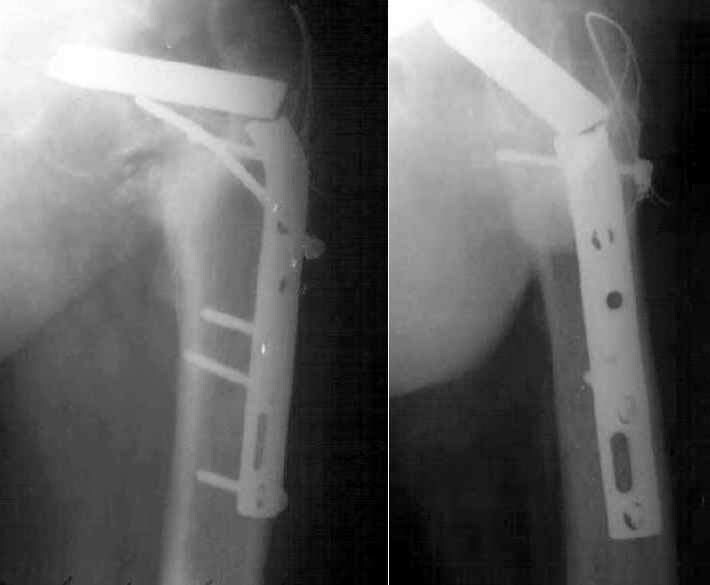 I also have had reasonable success with valgus producing intertrochanteric osteotomy for femoral neck nonunion especially when the neck shaft angle is down to 90 degrees as in these two cases. 50 patients with femoral neck nonunion treated with "Pauwels abduction osteotomy" followed 7 years. 7 (14%) went on to arthroplasty (and these did well despite the osteotomy). Other 43 OK with hip score average 91/100. 21 cases had AVN preop but only 3 went on to arthroplasty.